Ship Overhaul Backlog (Units)1 4 3 4 5 # of DMPs (Units) — 5 4 4 # of SRAs (Units) 87 82 91 81 # of PMAs (Units) 64 62 59 43 'The total overhaul backlog includes 3 ships in FY 1988, 2 ships in both FY 1989 and FY 1990, and 1 ship in FY 1991 which are backlogged due to a lack of fleet modernization program (FMP) funding. U.S. NAVY (continued) ments to contractors for ships and equipment. Outlays best indicate the level of business activity gener- ated by Navy spending. Source: IMA Associates, Inc. $8.9 billion in FY 1988 to $10.9 bil- lion in FY 1991. This growth oc- curs despite the fact that obli- gational authority is much lower in FY 1991 than FY 1988. Shown in Exhibit 3 is the break- down of the shipbuilding budget request for the FY 1988-1991 peri- od. Exhibit 4 shows the projected program over the next five years. SSN 688 submarines originally planned for FY 1991 and 1992. SSN 21 and SSN 688. The current plan is now to end the SSN 688 pro- gram in FY 1990. In FY 1991 Navy plans to order two SSN 21's and maintain a construction rate of three per year thereafter. Navy plans to build DDG 51 Ae- gis destroyers at the rate of five per year over the next five years. This program is a target for budget cut- ting—most likely by stretch-out— building fewer ships per year over a longer period. MCM mine countermeasure ships have been added for FY 1990. Expenditures for ship mainte- nance are projected to increase over the next two years. Navy plans to spend $5.2 billion in FY 1990 and $5.4 billion in FY 1991 for active fleet ship maintenance and modern- ization. These figures compare with projected spending of $4.7 million for ship maintenance and moderni- zation in FY 1989. Details are shown in Exhibit 5. In addition, $208.0 mil- lion is to be spent on reserve fleet ship maintenance in FY 1990—vs. 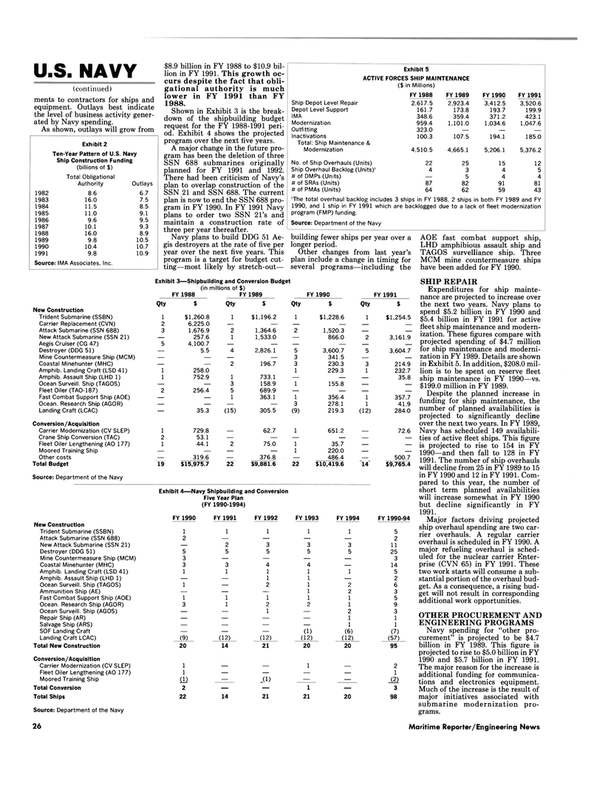 $199.0 million in FY 1989. Navy has scheduled 149 availabili- ties of active fleet ships. This figure is projected to rise to 154 in FY 1990—and then fall to 128 in FY 1991. The number of ship overhauls will decline from 25 in FY 1989 to 15 in FY 1990 and 12 in FY 1991. Com- pared to this year, the number of short term planned availabilities will increase somewhat in FY 1990 but decline significantly in FY 1991. Major factors driving projected ship overhaul spending are two car- rier overhauls. A regular carrier overhaul is scheduled in FY 1990. A major refueling overhaul is sched- uled for the nuclear carrier Enter- prise (CVN 65) in FY 1991. These two work starts will consume a sub- stantial portion of the overhaul bud- get. As a consequence, a rising bud- get will not result in corresponding additional work opportunities. Navy spending for "other pro- curement" is projected to be $4.7 billion in FY 1989. This figure is projected to rise to $5.0 billion in FY 1990 and $5.7 billion in FY 1991. The major reason for the increase is additional funding for communica- tions and electronics equipment.